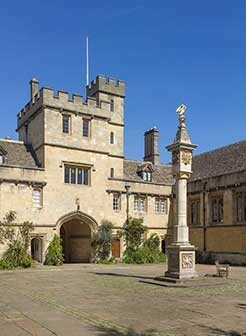 Oxford University. Credit: Andrew Shiva, Wikimedia Commons CC BY-SA. MARC U-STAR Scholars Jasmine Brown and Naomi Mburu were among 32 Americans to recently receive the prestigious Rhodes Scholarship at Oxford University in England. Rhodes Scholars are chosen for their academic and research achievements, as well as their commitment to others and leadership potential. As current MARC U-STAR Scholars, Brown and Mburu are part of an NIGMS research training program for undergraduate junior and senior honor students. MARC is designed to increase the number of people from groups underrepresented in biomedical sciences by preparing students for high-caliber, doctorate-level training. Credit: Joe Angeles, WashU Photos. 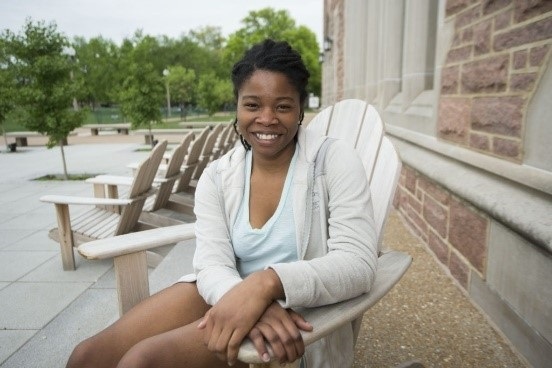 Brown, of Hillsborough, New Jersey, is a senior at Washington University in St. Louis and works as a research assistant at the Washington University School of Medicine. There, she studies genes that are protective against mental defects that result from West Nile-induced brain inflammation. After she receives her bachelor’s degree in biology, she plans to earn a doctorate degree in neuroscience as a Rhodes Scholar at Oxford University. “What I love about science is that it gives me tools to generate answers and to improve human health. It’s a fun process for me, but also a satisfying one because I can make an impact,” Brown said in a statement. Equally important to her studies, Brown is a champion for other underrepresented students in the sciences. After her own experience as the target of prejudice, Brown started the Minority Association of Rising Scientists (MARS) to support underrepresented students participating in research and inform faculty members about implicit bias. With the help of the National Science Foundation, Brown is working to expand MARS nationwide. Brown has given back to the community in other ways. She was a member of The Synapse Project , which prepares high school students for a neuroscience competition called Brain Bee . She was also a 2014-2015 candidate for Mx. WashU , an organization that raises money for a children’s program called City Faces . Credit: Marlayna Desmond for UMBC. 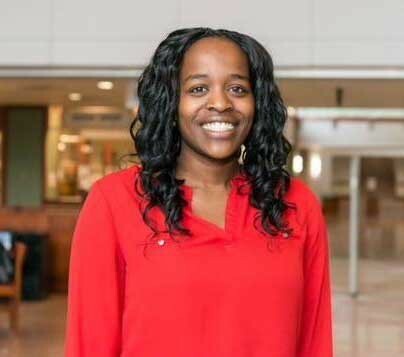 Naomi Mburu, of Ellicott City, Maryland, is the daughter of Kenyan immigrants and the first student in the history of the University of Maryland Baltimore County (UMBC) to receive the Rhodes Scholarship. The senior in chemical engineering plans to complete a doctorate in engineering science and to research heat transfer applications for nuclear fusion reactors. “I believe the Rhodes Scholarship will allow me to foster a stronger community amongst my fellow scholars because we will all be attending the same institution,” Mburu said in a statement. Mburu is currently working with Gymama Slaughter , UMBC associate professor of computer science and electrical engineering, to develop a machine that ensures human organs remain healthy as they await transplant . During her recent summer internship with Intel, Mburu developed an interactive model to estimate the cost of coatings applied to equipment. Her work helped improve pricing negotiations and established additional cost estimates for other chemical processes. Mburu’s aspirations involve not just science but education advocacy. Her passion for STEM education and increasing diversity in STEM fields led to her current involvement as a MARC trainee, where she’s learned to communicate her desire to make a global impact through her science research and her efforts to remove barriers to education equality. In her free time, Mburu has helped K-12 students with their homework during her time at UMBC. She continues to mentor youth and helps high school girls on STEM-related research projects. The Changing Needs of a Cell: No Membrane? No Problem! Russian nesting dolls. Credit: iStock. Scientists have long known that animal and plant cells have specialized subdivisions called organelles. These organelles are surrounded by a semi-permeable barrier, called a membrane, that both organizes the organelles and insulates them from the rest of the cell’s mix of proteins, salt, and water. This set-up helps to make cells efficient and productive, aiding in energy production and other specialized functions. But, because of their semi-permeable membranes, organelles can’t regroup and reform in response to stress or other outside changes. Cells need a rapid response team working alongside the membrane-bound organelles to meet these fluctuating needs. Until recently, who those rapid responders were and how they worked has been a mystery. Recent research has led biologists to learn that the inside of a cell or an organelle is not just a lot of different molecules dissolved in water. Instead, we now know that cells contain many pockets of liquid droplets (one type of liquid surrounded by a liquid of different density) with specialized composition and function that are not surrounded by membranes. Because these “membrane-less organelles” are not confined, they can rapidly come together in response to chemical signals, such as those that indicate stress, and equally rapidly fall apart when they are no longer needed, or when the cell is about to divide. This enables membrane-less organelles to be “rapid responders.” They can have complex, multilayered structures that help them to perform many critical cell functions with multiple steps, just like membrane-bound organelles. Scientists even suspect that the way these organelles form as droplets may shed light on how life on Earth first took shape (see sidebar “Could This Be How Life First Took Shape?” at bottom of page). Scientists have identified more than a dozen membrane-less organelles at work in mammalian cells. Several kinds found inside the nucleus—including nuclear speckles, paraspeckles, and Cajal bodies—help with cell growth, stress response, the metabolizing (breaking down) of RNA, and the control of gene expression—the process by which information in a gene is used in the synthesis of a protein. Out in the cytoplasm, P-bodies, germ granules, and stress granules are membrane-less organelles that are involved in metabolizing or protecting messenger RNA (mRNA), controlling which mRNAs are made into proteins, and in maintaining balance, or homeostasis, of the cell’s overall health.